We have just added 12,211 entries to the Geelong & District Database – these are burials in Colac Cemetery [extracted from the headstones]. We have to thank Ian Marr for permission to include these entries in the Geelong & District Database – for anyone who hasn’t looked at Ian Marr’s Cemeteries of South Western Victoria then you are missing an amazing project. You won’t find the entries in Ian’s on-line Surname Index because there are just too many – 12,211 entries and and more than 7,000 headstone photographs for the Colac Cemetery. For the very large cemeteries in the region, they are included on the CD / DVD / USB instead of on-line – making sure that people can still search the thousands of other entries at all the smaller Cemeteries. Ian has priced the complete set of cemeteries at an extremely affordable price and no-one should criticise him for trying to recoup some of the costs [including petrol] that he has expended over the years. Congratulations Ian – a really fantastic job – and he’s still going! Previous Colac in North Carolina! Next Darwin – NOT in Geelong and District! Looks a great facility. Researching ELLIS who migrated to Geelong in 1854 from Elstead Surrey England. Any chance of adding a tweet button under the share section? Susie, my that was quick! – Thank you! Now just about to Tweet the post above! You definitely need to contact the Colac Cemetery Office to enquire about specific locations. Details are on the Geelong and District Cemeteries page at http://zades.com.au/gandd/index.php/geelong/research/gdcem . There may be a fee involved but you can ask them that when you contact them. Hi Jamie, My name is Linda Fisk from Apollo Bay. l am doing a family tree & l recall Keith (if it is the same one) coming down to the Bay a lot of times. l think he was my dads (Robert Thomas Fisk)cousin. Suzie I am trying to find a man who is supposed to be buried at Colac. He died late 70s and his wife died early 50s. He was supposed to be John Jack and his wife Edith. Not on the headstone list, do you know where I can ask about those without headstones. Cannot find him in the index either so wondering if the name is right! Thanks Suzie, I do not have anything for him, cannot find the death in the index but mums cousin lived with him and her daughter says he was def buried there, I was aware that the headstones do not cover it all. I will try the cemetery trust. I’ll try again … it’s Susie, not Suzie! ooops sorry, and I know the feeling I always get Carmen! Hi David, I’ve just checked and unfortunately the link on the GnD Database and web site are broken – Ian was one of those who had to change after Vicnet limited the sites they supported. I’ve now fixed both and as soon as I’ve finished this I’ll also update the link in the blog above. Colac Cemetery is not online – only on Ian’s DVD and I can endorse first-hand the value of Ian’s DVD – worth every cent and more. http://www.ianmarr.net.au/CEMINDEX.HTML I can also confirm that the DVD includes a photo of Walter CLARK’s headstone which includes his wife Jane – as I said, worth every cent! Hi Susie, I am looking for a John Maloney b.1834 d.1886 in Colac and his wife Catherine Maloney (nee. McCoy) who died in Colac in 1918. I can’t find them in the database. Have all the headstones been listed? Hi Daniella, Generally you will find more than 50% of burials have no headstones and there would not be in the current list based on headstones. What does the death certificate say for place of burial? 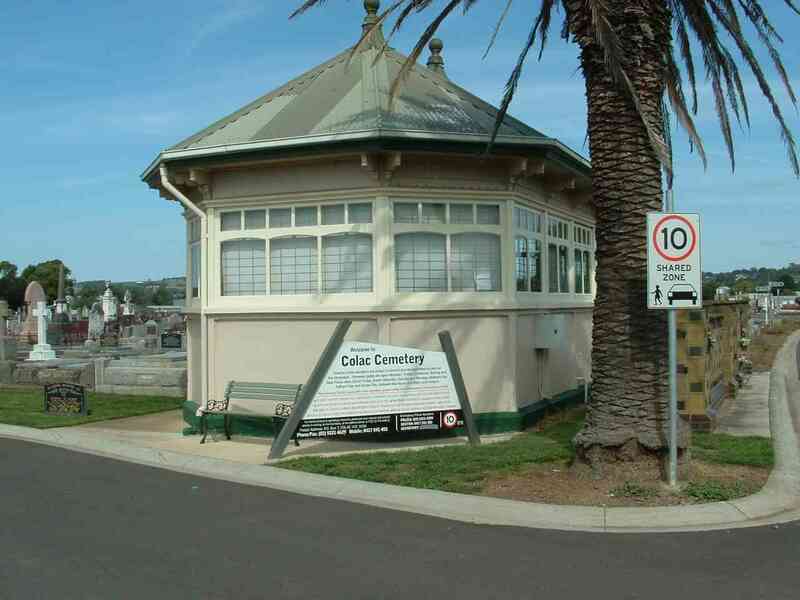 If it is definitely Colac then you either need to wait until the Colac burials are added to the Geelong Cemeteries Trust database or try contacting the Colac & District Family History Group to see if they have details. I know they’re working on a project to identify a number of known burials that aren’t recorded in the Burial Register. I’m looking for Charles Pedler McIntosh, d. 28 February 1925 and his wife, Agnes Marshall d. 3 April 1927. They are buried in Colac. I believe Charles was a bank manager. That’s all I know. I was wondering if there was a headstone, what does it say? They had one child, John (Jack) McIntosh who was buried there on 4 September 1933, aged 19. Oh – Thank you so much. I have found the location of this grave. I will endeavor to photograph it for you.